Protective eyewear is an important piece of equipment in the woodshop. We never think about it until it’s too late. I know I’m guilty of assuming my everyday glasses are more than sufficient protection, but there are definitely operations where you need more. 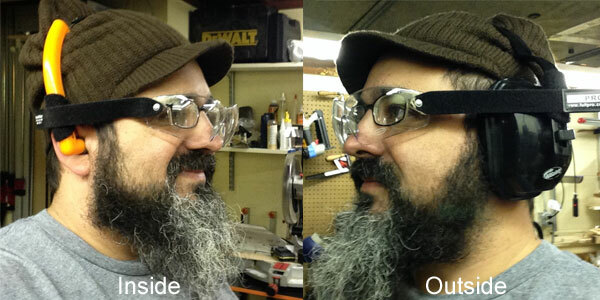 And it’s not just in the woodshop that you need adequate eye protection either. Now that the grass is growing and I’m doing yardwork around the house I find myself in all kinds of situations where there’s a chance something could be thrown back in my face. My biggest complaint with traditional eye protection equipment is that it’s either too bulky or it interferes with my hearing protection, especially when I wear something like the over-the-ear muffs I use when mowing the grass or doing heavy milling with my thickness planer. Not too long ago I heard from the folks over at FullPro and they asked if I would be interested in trying out their new eye protection system “SoundVision”. I’m always a little skeptical of some of the promises companies make about their “new & innovative” eye or ear protection systems, but I’m also open-minded enough to give them a try when I get a chance. So here’s what you need to know about “SoundVision”. Unlike traditional eyewear that has to be worn UNDER hearing protection, like earmuffs of all kinds, FullPro’s “SoundVision” attaches via velcro to the outside of the hearing protection. From my own experience wearing the “SoundVision” I found they were comfortable to wear, even longterm and on hot days. They were easy to remove without interfering with my earmuffs and because they come with a couple of extra velcro patches I could easily swap them from one set of earmuffs to another if I needed to change or share them. The only downside I experienced was that they didn’t fit over my prescription eyewear as well as I had hoped, but with a little adjusting of the velcro strips I was able to get them in a position that worked for me. Depending on what kind of hearing protection you use, in and around the shop, FullPro’s “SoundVision” just might be that something you’ve been looking to add to your safety gear. To find out more information about SoundVision and FullPro click here. You can also purchase them at Amazon.com by clicking here.